Order upon request. All items of Blue Fluted MEGA are assembled, painted and glazed by hand. 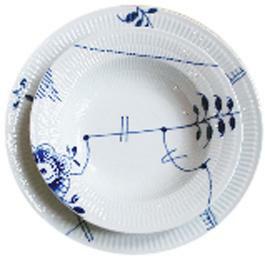 The Blue Fluted MEGA is a new version of the Blue Fluted pattern that is part of Denmark's cultural heritage. The original Blue Fluted dates back to 1770's. MEGA was proposed to the manufacturer by a young design student, Karen Kjældgård-Larsen. The pattern was to be much larger and repeated in fragments. The result is based on genuine affection for the traditional Blue Fluted pattern, yet bringing it completely up to date. *All prices are shown Excl. tax. A 8.875% tax will be applied when shopping in the store and on everything shipped within New York state. Unfortunately we do not sell online. Please call the store at +1 (212) 334-2556, or e-mail at info@justscandinavian.com, to place order. © 2015 Just Scandinavian. All Rights Reserved.